With the cannabis counterculture holiday of 04/20 capping off this week on Friday, you can bet that our tracking of the cannabis sector is going to ramp up right along with many of these stocks. It was back on the 4th of this month that we published an extensive list of marijuana industry stocks to track in anticipation of this event. For those outside the loop, “Four-Twenty” is a massive celebration each year on April 20th, to commemorate the cultural tradition of partaking in cannabis at 4:20pm on any given day. Cannabis companies use this as the perfect marketing ploy, and as a result, many do their highest sales of the year on the heels of this holiday. 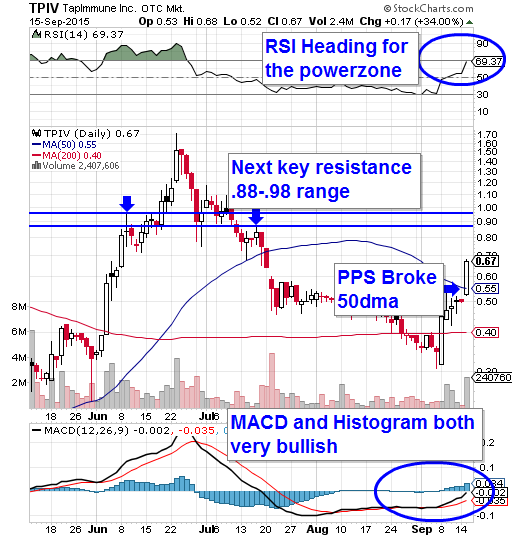 A few of the plays we highlighted earlier this month have already begun to see appreciable moves on the chart. Take OWC Pharma (OWCP) for example. Since the 4th, the stock has increased from .20 to .30, a 50% rise in under two weeks. We would expect to see similar, and even better gains coming from many cannabis stocks all across the board. That’s why we wanted to open up this week with a reminder to keep a close eye on anything even remotely tied to the space. EQLB was the big standout from yesterday’s report, performing extremely well after receiving first-billing in our premarket extended watchist. We caught this momentum play on an early scan and were very pleased to have included a mention of the stock as it blasted off right out of the starting gate. From an initial low of .0035, EQLB surged as high as .0062 for a very respectable 77% intraday rip on excessive volume; it traded its one month average ten times over. It and our next mention accounted for two of the top three most-actively traded stocks on the OTC, so we were certainly poking our noses in the right place. With momentum carrying over from the previous session to yesterday, moving forward, we’ll be open two the possibilities of either a sustained uptrend, or a potential dip-and-rip scenario. Our other nice spot from yesterday’s report was TPIV, which caught our eye in the wake of an early PR relating to one of its vaccine’s inclusion in a USDOD-funded study. We had already been following the stock all summer; regular readers will recall our tracking this play to double-bag gains back in June. That history, the press, and a ripening chart more-than warranted another mention, and it turned out well. TPIV ran from an early low of .52, and steadily rose toward its HOD of .68, marking a 31% increase. We’ll certainly continue to monitor its progress, especially given the fact that it maintained nearly all of its daily advances, closing just a penny off of the high at .67. Our readers are well aware of our penchant for bargain hunting, and we’ve got a potential bottom-watch candidate in CHKE to bring to the table today. The stock recently underwent a huge gap-down as a result of poorly-received earnings, and on Monday, was been beaten back to its annual lows. That sort of activity always draws our attention, and in this case, the snap-back could be quite significant with a huge gap to fill on the chart. 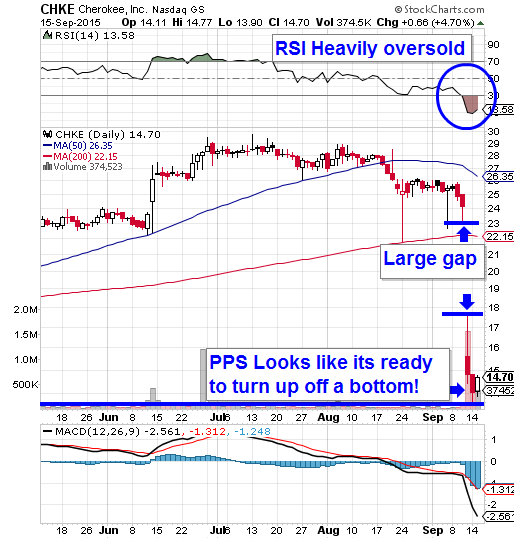 Add in analyst price targets ranging from $21-33, and this play begins to look out of place at such a low PPS. We’ll be scanning this one continuously for signs of recovery.